LaceLocker Leads The Way! | LEADER OF THE TRACK. As an avid trail runner and track and field athlete there have been many times where even after tying my shoelaces in a double knot, they have unfortunately come undone. I know many other athletes who have experienced the same thing and this can cost you a p.b, especially if you have a loose shoe which is about to come off in a race! My worst experience was running at State Champs in steeple-chase when my laces came undone on my right spike and after jumping from the steeple into the water-jump my spike shoe almost came off. I had to endure that for seven and a half laps which was really frustrating! i have also had a few trail runs where running through water and brushing up against foliage has caused my laces to untie and i have had to stop mid race due to the fact my shoe got stick in some deep mud and literally came off my foot! After all of this i had to do something about this issue and this is where i came across the LaceLocker which i found on Twitter surprisingly. The owner of LaceLocker- Carol ‘Stash’ Stanley got in touch with me and over several conversations she sent me out a pair of the LaceLockers and since then i have never looked back. I wear the LaceLockers in all my races and i haven’t had a problem since! They slip underneath your shoe laces and have a velcro strap which lock your laces in once you have tied your laces up. So simple and easy to use! i recommend the LaceLockers to any athlete or trail runner as they weigh nothing, are non obtrusive and so easy to put on! They even create custom made LaceLockers! Below is the LaceLocker story about how Carol got this invention started and what LaceLocker is doing to help the wider community! I was forever grateful when LaceLocker sponsored me when i went overseas to compete at World Trail Running Champs last year! LaceLocker is now doing custom made LaceLockers which means you can have your running club name or business printed on the LaceLocker. A great way to promote a brand or business at competition or corporate events! Click Here for more info on the custom made LaceLocker’s! Definitely follow this amazing brand on social media. Links are below the story! This accident spurred her “A-ha” moment, as she began brainstorming about a device to lock shoelaces in place without unraveling or cutting them. Development of the LaceLocker® was trial and error as she sought to create a product that keeps laces snug and secure, with safety, reliability, durability, functionality, ease of use and affordability at the top of the list of requirements. Prototypes were made, with months of testing. Over 100 athletes were asked for feedback after a marathon, and focus groups were formed to offer input. Once the design was finalized, Stash began the next phase: color and personalization. 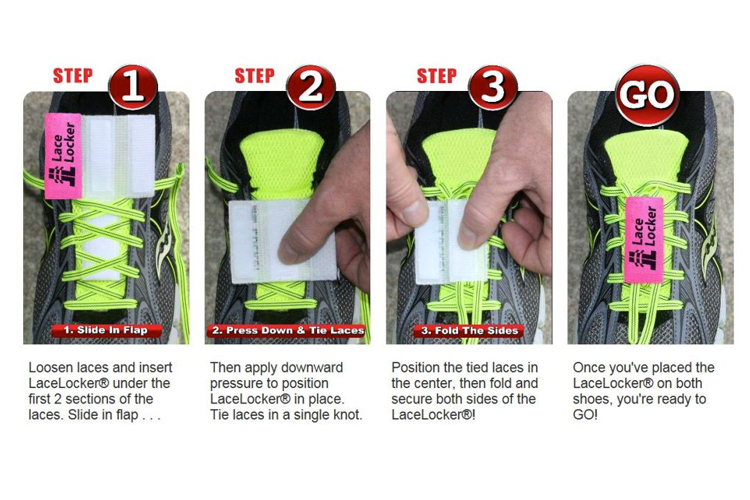 The LaceLocker® had to coordinate with shoe fashions and it had to offer customization for schools, teams, and fund raisers. The aesthetic aspect was equally as important as safety, so groups could match their logo with colorful footwear and promote their organization with a perpetual advertisement. ← Why everyone should experience trail running.